The Chinese company announced its 6S turbine platform includes three models: the G154/6.7MW, the GW164/6.45MW and GW171/6.45MW. The turbines are a direct evolution of Goldwind’s leading permanent-magnet direct-drive (PMDD) technology, the manufacturer said, and are aimed at high-, medium- and low-wind conditions. The company expects the machines to be commercially available in the first quarter of 2018 and will target offshore markets in China, Japan, South Korea and "later, Europe", Goldwind stated. 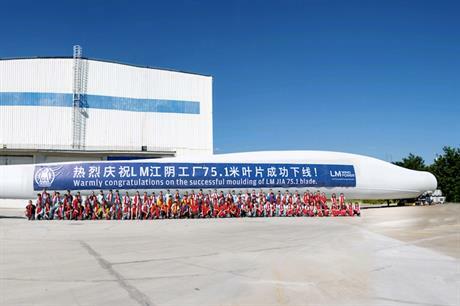 In September, GE-subsidiary LM Wind Power produced the first 75.1-metre blade to be used on Goldwind’s 6.7MW turbines. LM Wind Power signed a supply deal with Goldwind for the blades at last month’s China Wind Power 2017 event in Beijing. A prototype of the GW154/6.7MW will be installed early next year, the manufacturer stated. The turbine is designed for "wind class I areas off the Fujian and Guangdong coast, east of China", Goldwind added. Meanwhile onshore, Goldwind became the latest manufacturer to join the 4MW class last week, as it unveiled a turbine aimed at medium-wind speeds. Its GW4S class has a rated power range of between 4MW and 4.2MW and features rotor diameters of up to 136 metres.